If your teeth cannot be saved from extraction, then dental implants may be the next best thing to supplement the functionality of your mouth and the strength of your bite. Dr. Richard Smith recommends the use of dental implants when permanent, adult teeth have been lost and their replacement becomes necessary, either for practical or cosmetic reasons. In preparation for dental implants, dental x-rays will be carried out to give the dental surgeon a coherent perspective of the underlying bone and its surface area. The dental surgeon will make the initial incision on the spot where the implant is intended and this will give him access to the underlying bone. He can then proceed to drilling into that part of the bone to put the implant in place. Once the implant is in position, the process will be paused until it has completely fused with the bone. After this, posts will be attached onto the implant and will function to anchor the crowns or other dental restorations. The crowns are fabricated to look like natural teeth and intended to fill in the gap created by the patient’s missing teeth. 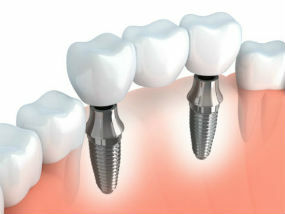 Dental implants are generally made out of titanium. Titanium is the preferred material because it has been found to be highly compatible with the body’s composition and gives the implant the strength that it needs to support the rigorous daily activities of the patient’s mouth. Dental implants may be used to replace a single tooth or multiple teeth in the mouth, and are more permanent alternatives to removable dentures, bridges, or crowns. Although dental implants are very sturdy and can last for up to several years, it is very important to practice proper dental hygiene to maintain good working condition.